race relations act – why now? – welcome! You are here: Home › CnP › race relations act – why now? with reference to my post below on the race relations act, here is an interesting piece by asly rahman, taken from malaysiakini. This sounds like a good idea; but after 51 years of independence? We should have had this act to prevent the emergence of race-based parties and to ensure that all citizens be given equal opportunity and the rights and privileges accorded to them as a result of surrendering their natural rights to the state. After 51 years of the institutionalisation of ethnocentrism and many times outright racism in terms of allocation of resources, open-secret indoctrinations, and the exploitation of racial and religious issues for political gain, we are now proposing an act to improve race-relations? I am now puzzled – by the inherent contradictions we are confronting and will continue to confront vis-à-vis this proposed act. How will we judge the existing race-based parties that live and breathe on racial sentimentality to the point of being seditious in their pursuit of hegemony? How will this act be used against governmental institutions such as the Biro Tata Negara whose livelihood has historically been based upon making sure that the damaging ideology of Malay (Pseudo) supremacy will forever prevail? How will this act be used against public-funded educational institutions that promote "Ketuanan Melayu" which is clearly antithetical to our will to teach multi-racial understanding? How many members of Parliament will be arrested under the Race Relations Act based on the nature of speeches they had given? How many teachers and public servants will be investigated for using their position to deny their students and clients respectively the rights to be treated equally before the Constitution – rights accorded regardless of race, religion, ethnicity, color, creed, and religious orientation? How many years of the possibility of multicultural education and intercultural understanding have we lost as a consequence of not having a Race Relations Act way back on Sept 16, 1963 during the formation of Malaysia? How many racist policymakers in governmental and non-governmental sectors have we produced as a result of no Race Relations Act? How many racist youth party leaders have we given birth to and how many can we afford to see "cloned" and "artificially inseminated" as a result of the absence of any act that erases racism and curbs arrogance and greed? How will this proposed act, if passed, abolish the Internal Security Act that has been used to crush amongst others, those who oppose race-based policies and fight for racial and social justice? How will this act allow for the passage of a new brand of politics – one that sees a truly multiracial party ruling the country and implementing policies based on the philosophy of equality, equal opportunity, excellence and empathy? We are proposing this act at a time when we arrest our citizens for no good reason and no trial, using the instrument of oppression no longer suitable for an ultra and hyper-modern society such as ours. We are proposing this out of desperation and out of sync with the mass sentiment of the day; at a time when the Berlin Wall of our Balkanized race relations is crumbling by the day, each brick in the wall ripped off by the power of the digital tsunami. We are hearing this proposal coming from a race-based coalition government that wants to ensure that the divide and conquer and sub-divide and sub-conquer policies of British colonialism prevail in the filter-funneled minds of our little brown brothers and sisters. Perhaps what we need is not another act to add to the ambivalence of acts such as The University and University Colleges and the Internal Security Acts but to go deeper into our public institutions and ask why we have not progressed much in race relations after all these decades. We should investigate further how the New Economic Policy itself as a grand Stalinist-inspired programme of national development has contributed not only to the deterioration of race relations but has cemented racism in newer forms – both subtle and open. We should investigate how the topic race relations has been taught in our community centers, schools, universities, and other public institutions to see what goes into the mind of our citizens by way of schooling, indoctrination, training, and education – to see what went wrong and what is still not right. We should examine governmental policies and see if we indeed uncover practices that promote equality, equal opportunity, and empathy in place; policies that ought to have improved race relations, inclusionary, and integrate rather than disintegrate the different races. This will be a mind-boggling noble proposal for us to contribute ideas. Do we need a new act? Or will a new government with a brand new ideology suffice? But as peace and justice-loving Malaysians, let us offer constructive ideas to this proposed act. Let us propose that only a truly multiracial party that has the will, motivation, intelligence and the set of acquired skills should be given the mandate to implement a Race Relations Act. Any communal-based party is too much a contradiction to put their act together on this one. 4 Responses to "race relations act – why now?" adding 2 articles for you to digest and as to why this race relations act is an impossible from inception. and here’s a damning news from Ghana … telling its people not to come to malaysia as they are discriminated against and not welcome because of their colour! anti umno act? good idea! but wait till umno are out as the gomen! why after 51 years? that’s because isa has been performing well until syed botak f**ked it up big time recently that made it a global joke! even my gwailos friends were laughing hysterically while the japs whom i drank sake with slapped their foreheads and rolfmao. if you had been the chance to see the expressions of the yankees there upon reading such absurdity, you would sink your face into your hands! but never mind. we know this gomen very well. style mesti mahu! 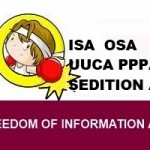 so err… replace isa with something else lah … in this case, as proposed now, rra. but call all the oppressive laws under the malaysian sun this – ANTI UMNO ACT! now … that’s appropriate! no need to ‘talk-roundabout’. Race relation act now because they already desperate!